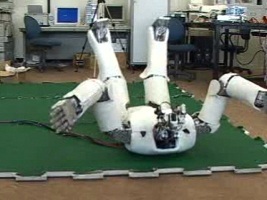 Robot can get back on its feet (video). When They come for us, knocking Them off their feet will not be sufficient anymore. Let's just hope that the "off" button is not too hard to find. It is clear from this story, that if such a robot has a built-in bluetooth adapter, he will be stealing laptops from cars. What do we do? What dooo we do?! Here is what: we make sure the laptops smell like food, then just watch Them duking it out with the bears. But here is a problem: what do we do when robot bears come after us? Turns out we are all covered. We have the right to bear arms. And as you saw in the video, without arms They can't get back on their feet. back here(india), we don't [have the right to bear arms]. oh mygawd, are we doomed ? possibly. unless of course the researchers in their infinite wisdom chose to use tcl. in which case we are fine. as the bots would tickle themselves to death after the beer-binge. It probably does use tcl via Expect. expect "human azimuth=0 elevation=0 distance=1"
Somehow antropomorphic robots look scarier. I wonder how arctomorphic robots will be perceived.